Melonseed: All your life you have lived in Switzerland, surrounded more by mountains than the ocean, which is very untypical for a surfer. How then did you get into surfing? Would it not have been easier to become a pro Snowboarder? Martin: When I was 7 years old, my grandparents took me to Gran Canaria where I tried surfing for the first time. Since that moment, I knew that was it. From then on, my family had to spend every spare minute in a place where I could surf. At 14, I began surfing on the river in front of my house. It was also the age I got my first surfboard. I was super happy that I had found a way to surf when I was at home. I also tried out wakesurfing, just to spend as much time as I could in the water. Water is definetly my element. Melonseed: You just mentioned that water is your element. 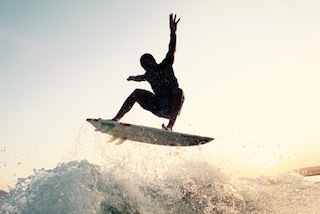 What was the motivation that got you so deeply rooted with surfing? Martin: Thinking deeply, and biting into his melon popstick. It is a mixture of different things that drive me. I love the relaxed surfing lifestyle. I love being in the ocean, and the power and energy you feel when you are riding a wave. Melonseed: What have been your biggest successes? Martin: I got European Champion in 2012, 2013 and 2014. In 2000 and 2007, I became Swiss Champion in wave surfing. Although I am successful in river surfing and wakesurfing, for me, surfing in the ocean is the greatest happiness on earth, along with constantly progressing my skills. Melonseed: What is your key to success regarding your mental and physical health? Martin: Not working. Smiling. I still have to work during summer season in Switzerland to afford my free surfing time during winter. My work as motorcycle mechanic is very demanding and I try to eat healthy and jump on the board every day after work and surf as much as possible on the river or on the lake. I also do yoga because everyone is doing it. Laughing out loud. No, I am joking - I am not. Melonseed: Where can we meet you surfing? Martin: Indonesia during winter, autumn France and during July and August I am on the river. Melonseed: And now my obligatory question. What is your favorite ice-cream?